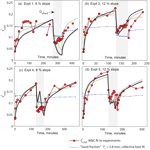 ESurf - Gravel threshold of motion: a state function of sediment transport disequilibrium? Abstract. In most sediment transport models, a threshold variable dictates the shear stress at which non-negligible bedload transport begins. Previous work has demonstrated that nondimensional transport thresholds (τc*) vary with many factors related not only to grain size and shape, but also with characteristics of the local bed surface and sediment transport rate (qs). I propose a new model in which qs-dependent τc*, notated as τc(qs)*, evolves as a power-law function of net erosion or deposition. In the model, net entrainment is assumed to progressively remove more mobile particles while leaving behind more stable grains, gradually increasing τc(qs)* and reducing transport rates. Net deposition tends to fill in topographic lows, progressively leading to less stable distributions of surface grains, decreasing τc(qs)* and increasing transport rates. Model parameters are calibrated based on laboratory flume experiments that explore transport disequilibrium. The τc(qs)* equation is then incorporated into a simple morphodynamic model. The evolution of τc(qs)* is a negative feedback on morphologic change, while also allowing reaches to equilibrate to sediment supply at different slopes. Finally, τc(qs)* is interpreted to be an important but nonunique state variable for morphodynamics, in a manner consistent with state variables such as temperature in thermodynamics. How to cite: Johnson, J. P. L.: Gravel threshold of motion: a state function of sediment transport disequilibrium?, Earth Surf. Dynam., 4, 685-703, https://doi.org/10.5194/esurf-4-685-2016, 2016.